HARIDWAR, India, Jul 19 2012 (IPS) - Every year Yogesh Mudgal treks miles through the mountainous roads of the Indian Himalayas during the holy Hindu month of Shravan, in July. The 54-year-old pilgrim hails from Alwar in northern India’s Rajasthan state. For the last 27 years, he has joined the millions of other Kanwarias – devotees of Lord Shiva –entering Uttarakhand state on the uphill trail of the holy river Ganga, to collect or take a dip in its soul-cleansing waters. But this July, Mudgal is more than just a devoted pilgrim: he is also an environmental activist, visiting village after village in an effort to spread awareness about the severe pollution of the Ganga, and the destructive impact of big dams that environmentalists claim are destroying India’s “lifeline”. “We are a group of 12 people visiting each village on our way and raising awareness about pollution of the Ganga,” Mudgal tells IPS in the holy city of Haridwar. Mudgal is a strong supporter of Rajendra Singh, a Ganga activist popularly known as the ‘waterman of India’ who is using his prestige to mobilise countless Kanwarias to save the sacred river from the impacts of hydel power projects that discharge enourmous amounts of pollutants into the water. Running for 2,510 kilometres, the Ganga is India’s longest river, irrigating 40 percent of the country’s land and providing fresh water to 500 million people who live along its banks. But a study conducted by the Uttarakhand Environment Protection and Pollution Control Board (UEPPCB) in 2011 slotted the Ganga’s waters into the most polluted “D” category, owing to the steady flow of human faeces, urine and human and industrial sewage into the river. India’s leading Ganga activists believe big dams are to blame. “Dams on the Ganga are destroying the river and pollution is changing its very character,” Singh, who heads an organisation called Ganga Mukti Sangram (Struggle to Save Ganga), tells IPS. Thanks in large part to the efforts of activists like himself, pilgrims are now arriving shouting slogans like, “Ganga ko bachana hai” (We have come to save the Ganga). “The dams cause an excess of silt deposits upstream, leading to algal growth that changes the character of the water,” he says. People who live around the confluence of the river with the sea, at Ganga Sagar in West Bengal where the holy river empties into the Bay of Bengal, are extremely concerned about the situation. “The Ganga Sagar islands, which are already threatened by climate change, are now more vulnerable than ever because there is no longer enough silt in the waters to buttress the landmass,” Singh tells IPS. He says construction of the Tehri Dam for a hydel project in the Bhagirathi river, one of the Ganga’s two headstreams, has almost killed the river. “Even the river Alaknanda (the Ganga’s source stream) could (suffer) as a result,” says Singh. 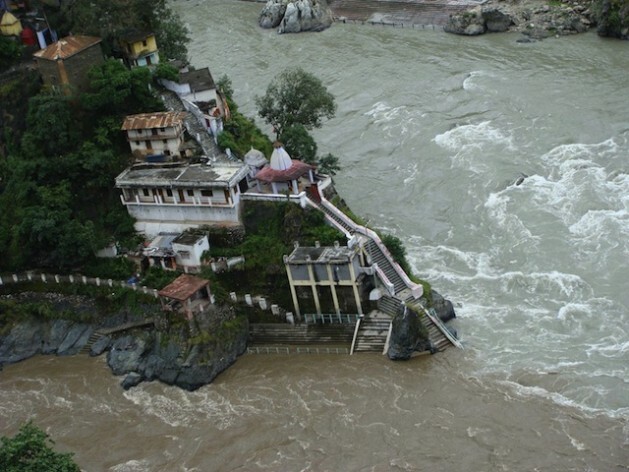 Green activists have already challenged government clearance of a hydel project on the Alaknanda river, three kilometres downstream from the Hindu pilgrimage centre Badrinath. Singh says the campaign will continue until the Indian government stops the proposed building of 39 dams across the sacred, ancient river. “It is going to be a long journey,” he predicts. 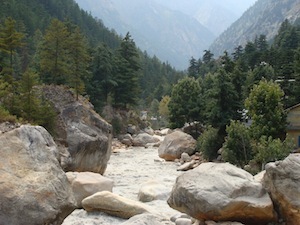 In March this year Singh and other key members of the National Ganga River Basin Authority (NGBRA) resigned in outrage over the government’s insensitivity towards Dr. G. D. Agrawal, an environmental engineer who started a fast-unto-death in protest of proposed hydel projects on the Ganga’s Himalayan tributaries. Agrawal was eventually taken to hospital and force-fed by the authorities. “The government has neither political will nor any executable plan. Though the NGBRA was convened three and a half years ago and tasked with restoring ancient pride and respect for the Ganga, it has met only twice,” says Singh. According to India’s Central Pollution Control Board (CPCB), the Ganga is unfit even for bathing in cities like Kanpur due to industrial effluents and human sewage. According to the control board, chromium levels in the water have reached a staggering 248 miligrams per litre (mg/l), against a permissible level of two mg/l. Surveys undertaken by government agencies say the concentration of chromium at Kanpur is 124 times the permissible level. India’s environment ministry estimates that 2,900 million litres of sewage flow into the Ganga every day from towns along its banks but the existing infrastructure is only able to treat 1,100 million litres per day. In April this year, Prime Minister Manmohan Singh assured swift action to save the river, but activists are sceptical and have taken matters into the own hands. “We will go from village to village to raise awareness,” Singh swears. Just as determined as India’s leading Ganga activists are the environmental groups who support hydel projects over other, more harmful alternatives like thermal, gas or atomic power projects. Avdhash Kaushal, who heads the Rural Litigation and Entitlement Kendra (RLEK), a non-governmental organisation based in Uttarakhand’s capital Dehradun, says the government called off several projects at the behest of “foreign-funded” monks and activists. “In 2012, state and central governments succumbed to pressure tactics of individuals (with personal agendas) and abandoned other hydro power projects in Uttarakhand purely on religious and political grounds,” he tells IPS. “We shall not allow the state’s environment and natural resources to be degraded by thermal, gas or atomic-based power projects,” vows Kaushal, who has moved court against the suspension of dam projects. He says countries like the United States and the UK are putting tremendous pressure on the government to pursue power projects that will devastate the environment. Furthermore, “People in the state are facing severe shortages of water and power. Those responsible for this include state and central governments, (holy men) and these foreign funded agencies who, in the name of Nadi Bachao (Save the River) are hell bent upon the closure of these hydel power projects,” he says. I think they need take off the blinders of $greed$ and see what the Ganges, spiritually, physical and mentally means to India and the world on a whole.